People at a holiday camp where a ceiling collapsed have said it was like "a bomb going off". 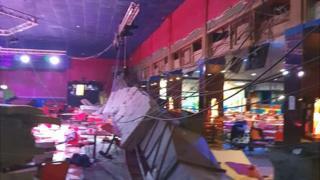 About 100 people were in the entertainment hall waiting to play bingo when sections of concrete fell down on Wednesday evening. Eighteen people needed treatment at the scene, including six who were taken to hospital following the collapse at Pontins Brean Sands, Weston-super-Mare. A spokesperson for Pontins said they would not be commenting at the moment. An investigation is being led by Sedgemoor District Council. One of the injured people, Wendy Jones, from Hereford, was trapped under the debris in her motor scooter. The 67-year-old's daughter Hayley Kendle described the incident as "horrific". She said: "I heard a crash, and next thing the ceiling was falling in on the building. She was under the rubble and they had to drag her out. People were screaming and shouting and yelling for us to get out of the building." Mrs Jones suffered a broken hip and a suspected broken collarbone, and earlier underwent surgery at Weston General Hospital. Holidaymaker Jennifer McGary said: "Our first reaction was that it was a terrorist attack. "I know it sounds ridiculous but you just heard this loud noise that I can only describe as [like] a bomb going off. "Suddenly it looked like the entire roof was collapsing - I just ran to grab my 11-year-old off the dance floor and my 15-year-old then tried to get out of there as quickly as I could. "There were screaming children everywhere, people crying everywhere, there was a boy in a wheelchair outside who was calling for his mum." Ms McGary added she felt the place "should be shut down". George Clark was injured by a falling piece of concrete that hit his shoulder. "I had to throw myself to the ground, and crawl out under the tables - the tables were holding up the weight of the ceiling," he said. "Everyone just panicked, there were screams, kids crying and shouting, it was just bedlam in there." Sarah Prosser and her husband were also in the room when the ceiling fell. "It was like a volcano - all of sudden it erupted, all smoke was there and if I hadn't have moved a concrete slab would have landed on my head and split my head open." "I wasn't worried about myself, I was worried about the kids - there were small babies in there, there were toddlers in there on the stage. "There was dust everywhere," she added. Image caption Those at the scene said the area was filled with dust "like a volcano"
A Sedgemoor council spokesman said the building was not owned by the authority. He added: "We have environmental health officers at the site at present and will issue a further statement, based on their initial findings, but the investigation is likely to be complex and run for several months." Officers from Somerset Building Control Partnership are also on site. A spokesman for the Health and Safety Executive said: "HSE has informed the police that this is a local authority enforced premises and therefore for the police and local authority to determine who will ultimately investigate."